If you thought our neighbour was satisfied attacking only Indian soldiers and civilians, think again. The Great Indian Bustard bird, critically endangered, is also murdered by Pakistanis, simply for being 'Indian'. Now, what is in a name, you may ask. Well, the Great Indian Bustard could do with an advertisement in the Gazette to change its name to Godawan Bustard — as it is known locally. 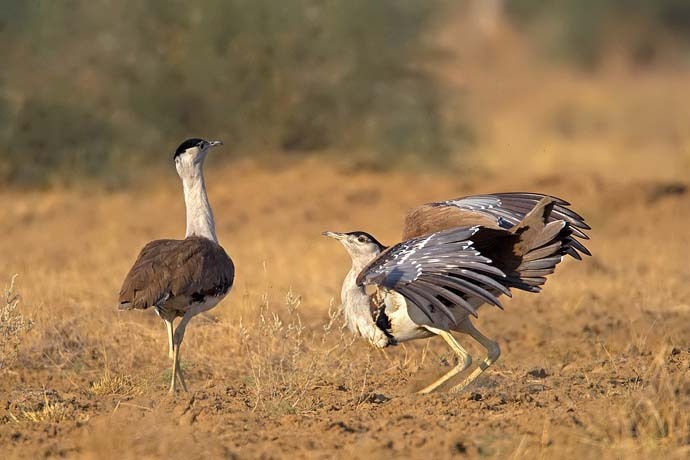 The Great Indian Bustard is a charismatic species — it is endemic to the Indian subcontinent. To be more precise, it is found only in the Thar Desert in India, besides a very small population (of around a dozen birds — and not one breeding male amongst them) in Kutch, Gujarat. The numbers are virtually extinct in the Deccan plateau where they once roamed in large numbers in a happier time. According to the IUCN Red List (the world's most comprehensive inventory of the conservation status of species), the Great Indian Bustard is Critically Endangered. We are not surprised, considering the population (a total of about 100 birds — give or take a few) is on the verge of extinction. Besides the obvious factors of habitat degradation, high-tension power lines and threats from predators, poaching is a huge reason for the abysmal numbers. In India, this state bird of Rajasthan is listed in Schedule I of the Wildlife Protection Act — it is accorded the same level of protection against poaching as the Royal Bengal Tiger or the Gir Lion. Therefore, poaching is out of the question. However, our neighbours suffer from no such compunctions. The bird flies across the border to Pakistan — considering it falls as a part of its habitat, and its intellect not being sharp enough to perceive the human-made borders. Once across the border, it is punished for this folly — and for its name. Our neighbours across the borders do not hesitate to kill just soldiers and civilians, but also the poor bustard — not so much for its meat and for sport, but for bearing “Indian” as a part of its name. This human pettiness is perhaps a bottomless pit. The Great Indian Bustard is paying the price.